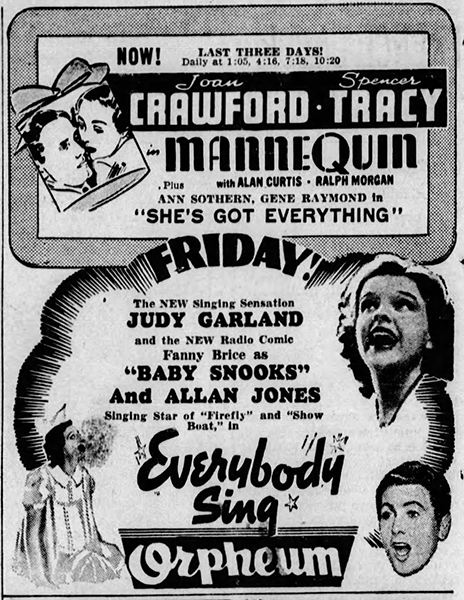 February 15, 1938: Here are a couple of fun ads for Everybody Sing. 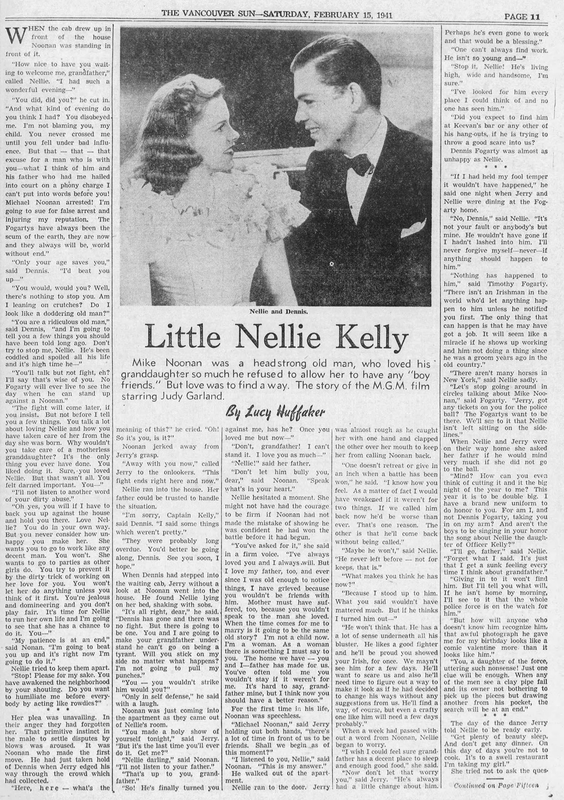 February 15, 1941: The storyline of Little Nellie Kelly, as published in the “Vancouver Sun” out of Vancouver, British Columbia, Canada. 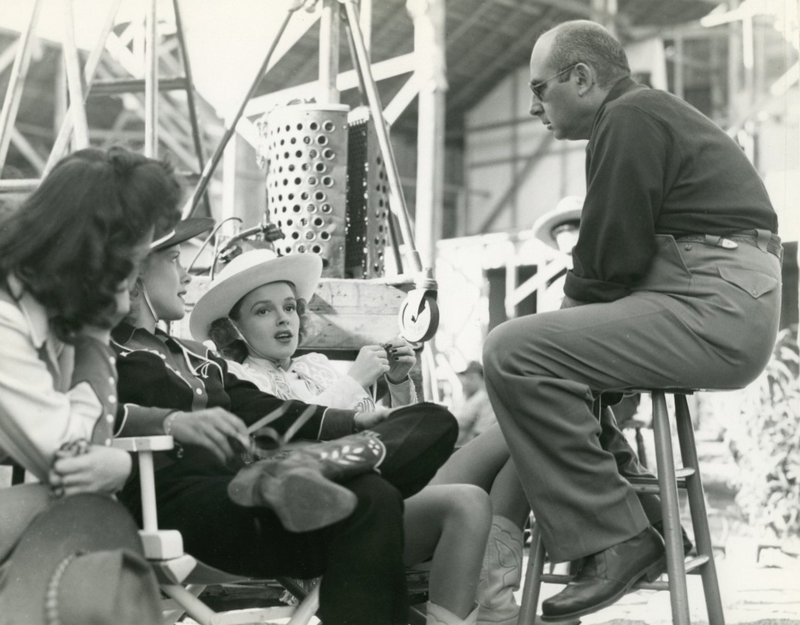 February 15, 1943: Filming on Girl Crazy continued with scenes shot on the ‘Exterior Corral” set. Time called: 11:00 a.m.; dismissed: 5:40 p.m. 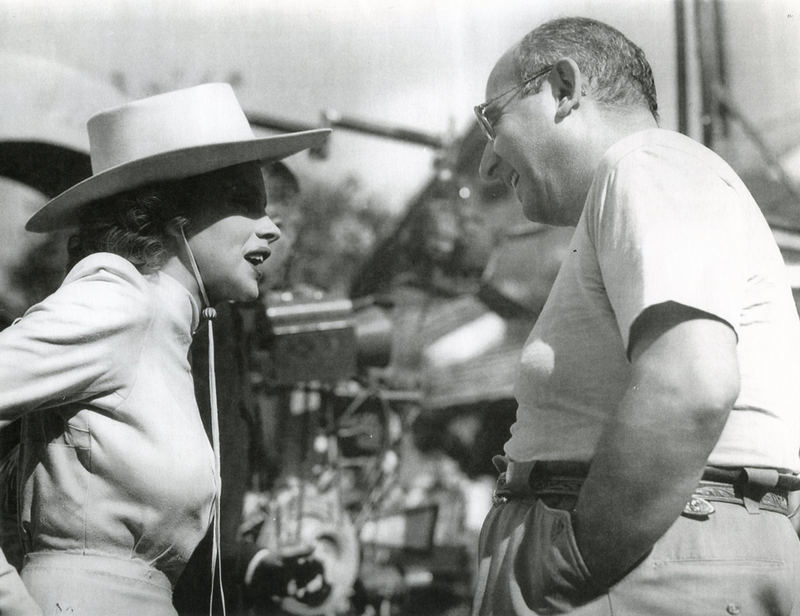 Photos above: Judy with director Norman Taurog on the set around this time. 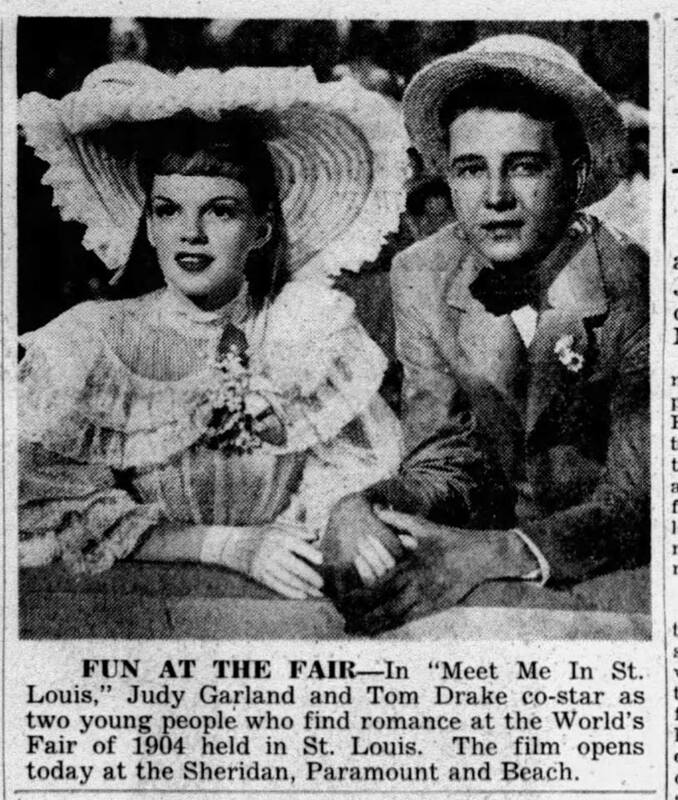 February 15, 1943: Filming on Meet Me In St. Louis continued with scenes shot on the “Exterior Smith Home and Street” set which was the newly completed “St. Louis Street” on MGM’s Backlot #3. 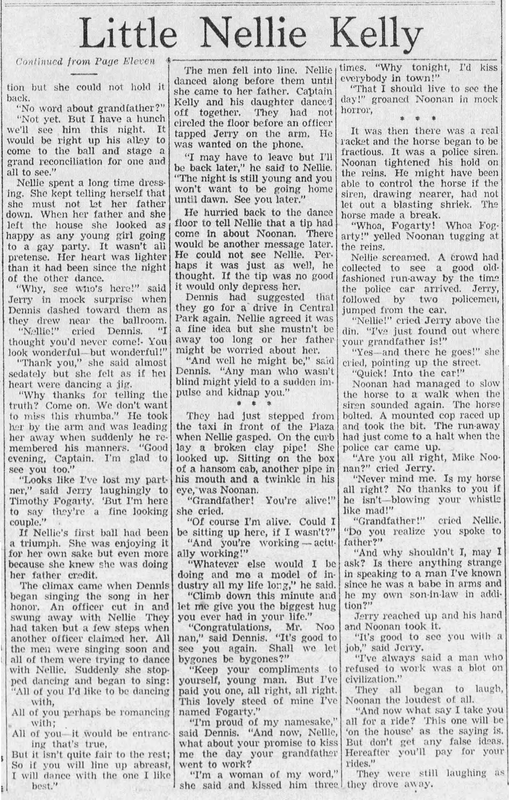 Time called: 11:00 a.m.; dismissed: 3:45 p.m. It’s unknown if the scenes shot were those with Judy in her tennis outfit (“Summer 1903”) or those of Judy and the rest of the cast for the finale sequence (“Spring 1904”). The gorgeous standing set was built for the film and some people at the studio thought it was a waste of money. The set proved to be one of the most versatile on the backlot, appearing in many films (e.g., In The Good Old Summertime, The Long, Long Trailer) and later in TV shows (including a few episodes of “The Twilight Zone”). Check out The Judy Room’s “Garlands For Judy – Judy on the Backlot” edition for more information about where Judy filmed scenes for her films on the MGM backlot. The photos above include Judy with Lucille Bremer, producer Arthur Freed, Tom Drake, Margaret O’Brien, and Joan Carroll. February 15, 1945: A busy day for Judy at MGM, filming The Harvey Girls. She had a fitting from 1:00 p.m. to 2:55 p.m., arriving for the fitting at 2:10 p.m. She then had rehearsals with Kay Thompson. She was due for that at 2:30 p.m. and arrived at 3:00 p.m.; dismissed at 4:00 p.m.
During this rehearsal, the two were recorded singing “In The Valley.” This is the only known recording of Judy and her friend and mentor (and Liza’s Godmother) Kay Thompson singing together. 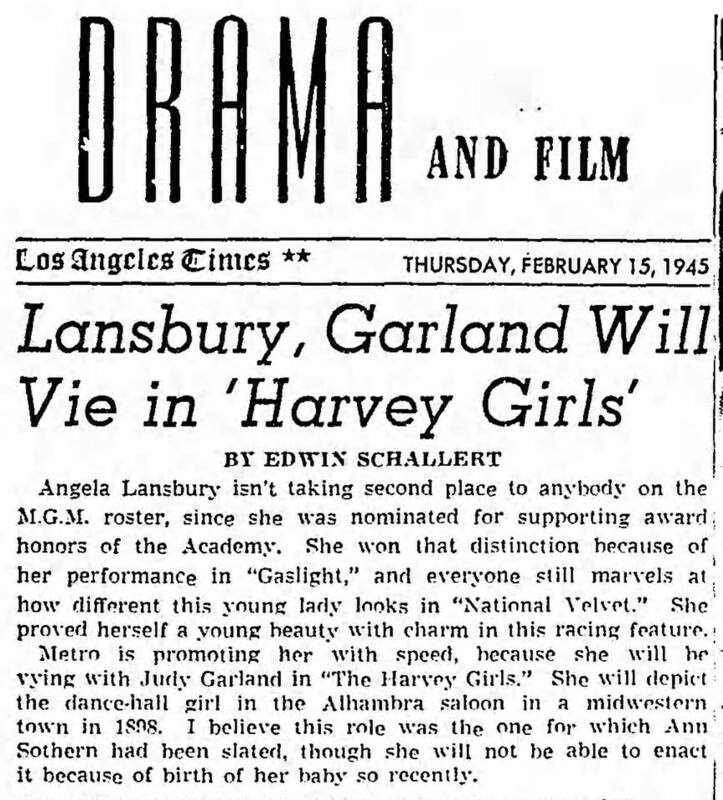 Photos: Article about Angela Lansbury starring with Judy in The Harvey Girls; two clippings promoting Meet Me In St. Louis (which was still doing big business in theaters around the country). 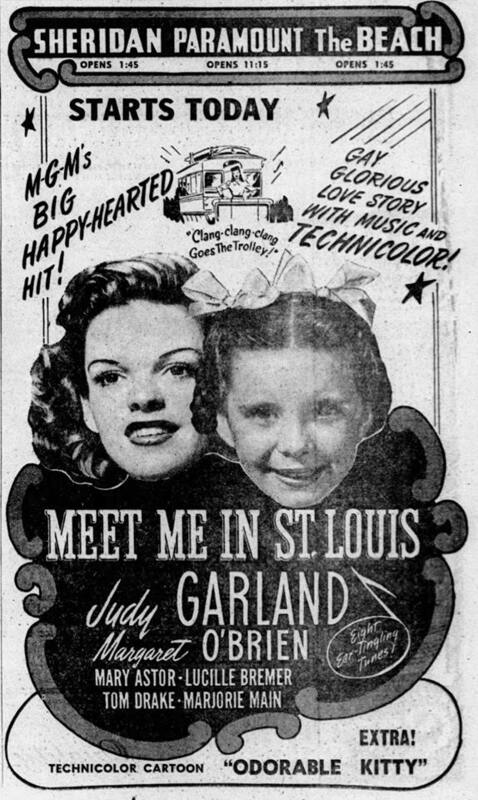 Check out The Judy Room’s Extensive Spotlight Section on Meet Me In St. Louis here. 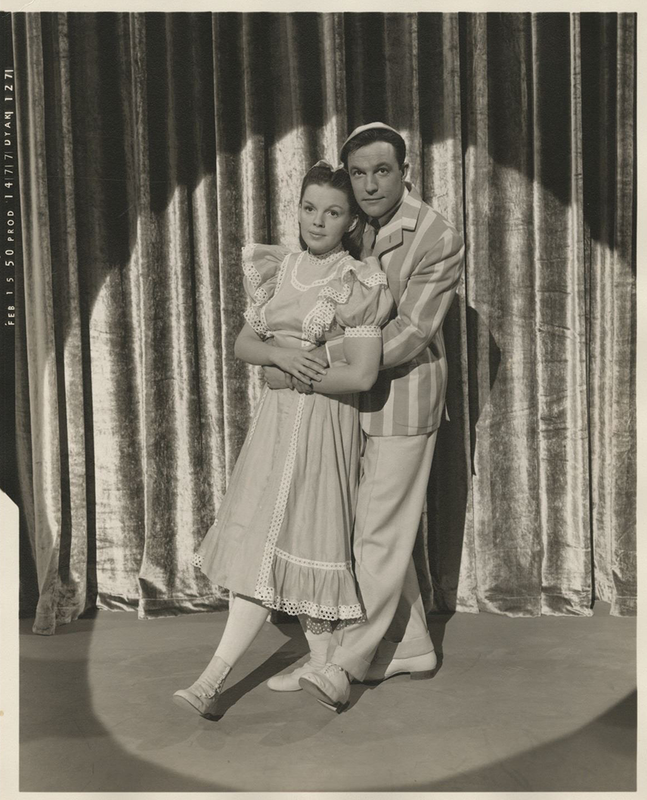 February 15, 1950: Judy and Gene Kelly filmed the “You Wonderful You” reprise version for Summer Stock. Check out The Judy Room’s “Judy Sings! – On The Radio” pages here. 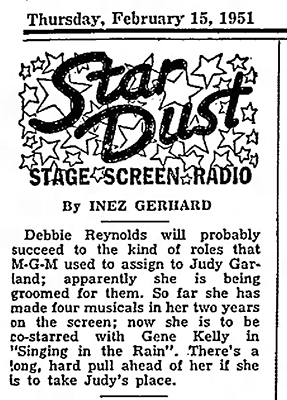 The second is part of Inez Gerhard’s column “Star Dust” in which he notes that Debbie Reynolds was on tap to be assigned the roles that might have gone to Judy had she stayed at MGM. 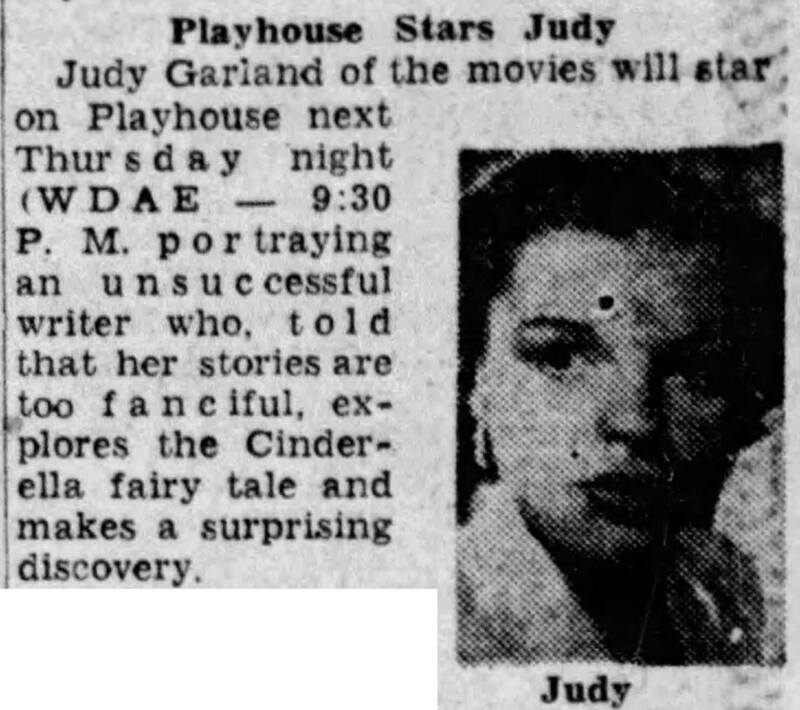 Gerhard was correct in stating that Reynolds had “a long, hard pull ahead of her if she is to take Judy’s place.” Although she never took Judy’s place (who could?) Reynolds became a legend in her own right. 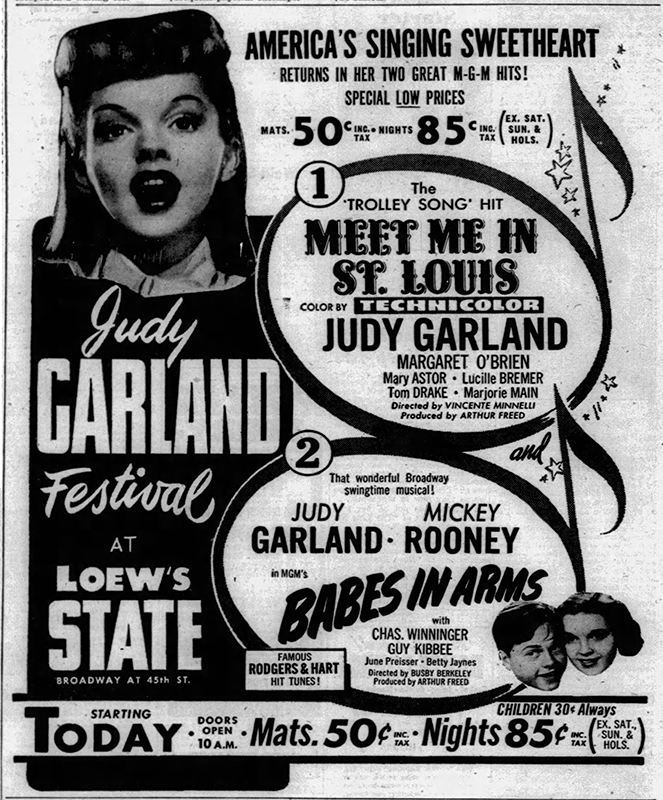 February 15, 1952: The Judy Garland Festival at Loew’s State Theater in New York City began on this date. 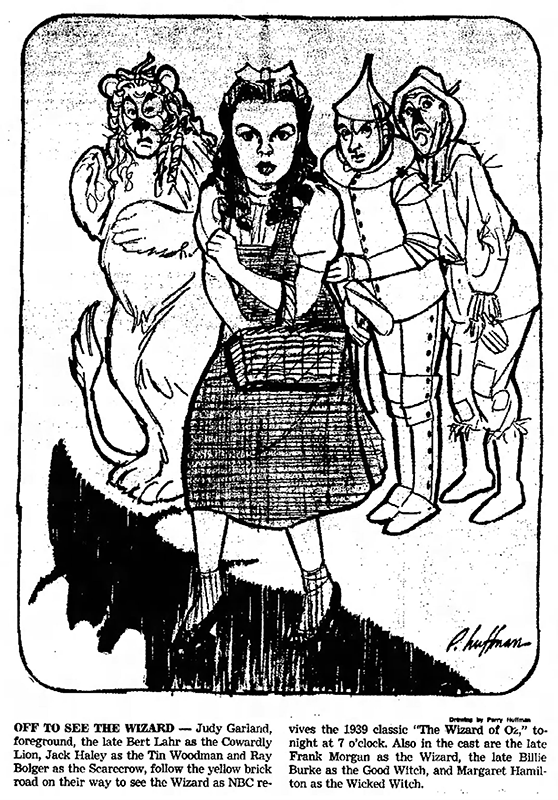 The theater was Loew’s (MGM’s parent company) flagship theater in New York and was the site where most of Judy’s MGM films premiered and/or played first run in the city, including Meet Me In St. Louis eight years before. 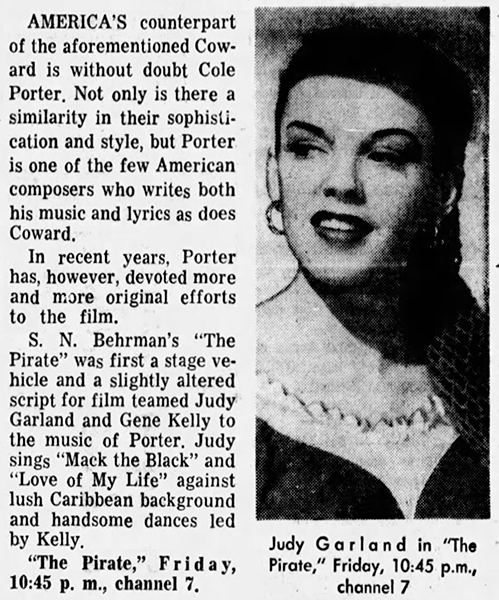 February 15, 1959: Judy was set to perform at The Fontainebleau Hotel in Miami, Florida. She played the venue, to sellout crowds, February 17, 1959, to March 1, 1959. The second clipping is a notice of an upcoming airing of The Pirate in San Francisco, California. The notice points out that Cole Porter is America’s answer to England’s Noel Coward. February 15, 1963: Judy was still suffering from a bad case of the flu, and exhaustion, and had to bow out of her scheduled shows at Harrah’s Resort in Lake Tahoe, Nevada. Her old pal Mickey Rooney came in to replace her and complete the rest of the engagement. February 15, 1965: “On Broadway Tonight” had premiered on February 5, 1965, but was rerun in smaller markets for a few weeks afterward. This airing was in the San Antonio, Texas, market. 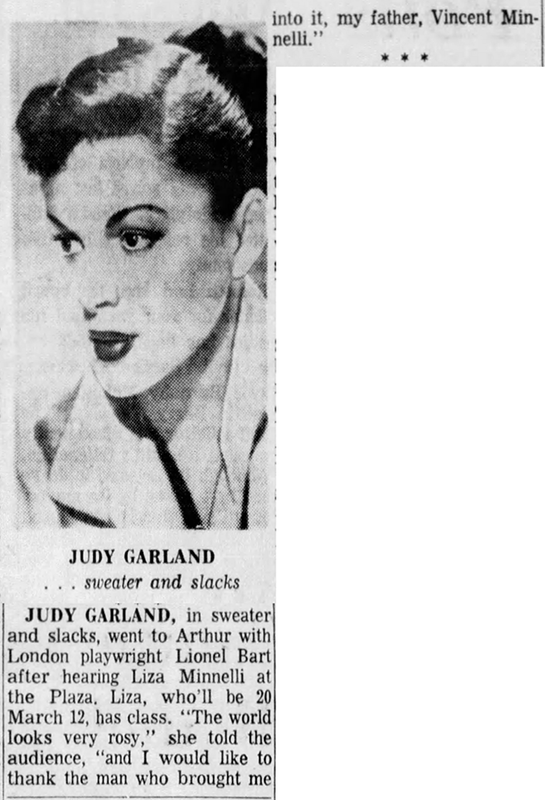 February 15, 1966: Columnist Earl Wilson reported that Judy had recently been seen at the popular nightclub spot, “Arthur,” with Lionel Bart. Bart was the composer, lyricist, and playwright for “Oliver!” which was the insanely successful musical adaptation of “Oliver Twist” by Charles Dickens. Judy loved the show, especially the song “Consider Yourself” which she would sing with her kids as well as with them on the Christmas episode of her TV series. She also performed an amazing, spine-tingling rendition of the show’s big ballad, “As Long As He Needs Me” on the same series. 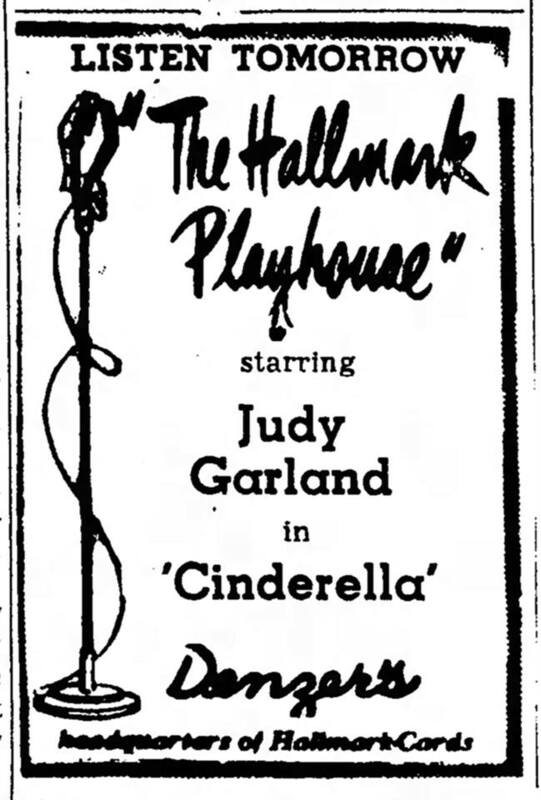 Also on this date, Mike Connolly’s column in the “Hollywood Reporter” announced that Judy had been signed to do a dramatic role in an upcoming episode of “Chrysler Theater.” He also stated that Judy’s daughter Lorna and son Joey were signed by a talent agency, under the names “Lorna Herron” and “Joe Wiley.” Judy never appeared on the show. 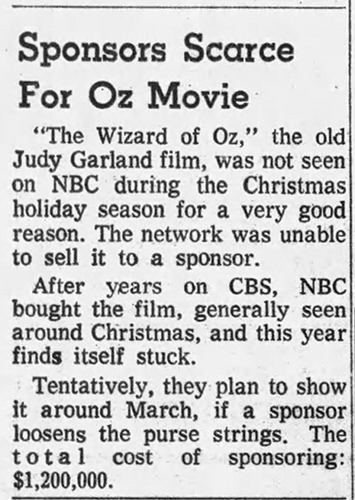 February 15, 1969: Apparently NBC was having a hard time finding a sponsor for their next airing of The Wizard of Oz on TV. The network took over from CBS in 1968 showing the film on April 20, 1968. 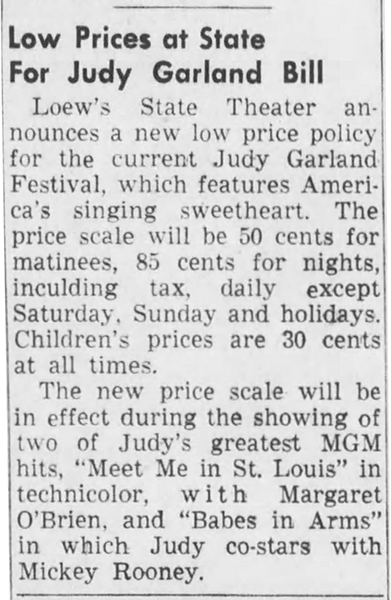 The next showing (obviously they found a new sponsor) was March 9, 1969. Those outdoor shots of Judy on the set of “Girl Crazy” are curious, as the entire number was filmed on a soundstage. Odd. I’m a fan of the ’60’s sci-fi show “The Outer Limits.” In an early episode, “The Man Who Was Never Born”, a lot of action takes place on the front porch of the “Smith” Victorian home. Lost of shots, too, of the house directly across the street. Even thought it’s set and shot in 1963, everything looks exactly the same as it does in the 1944 film. less than a year she’d be professionally relying on Sid once again! I enjoy catching locations on MGM’s backlot in those TV shows of the 50s and 60s. They sure got a lot of use!